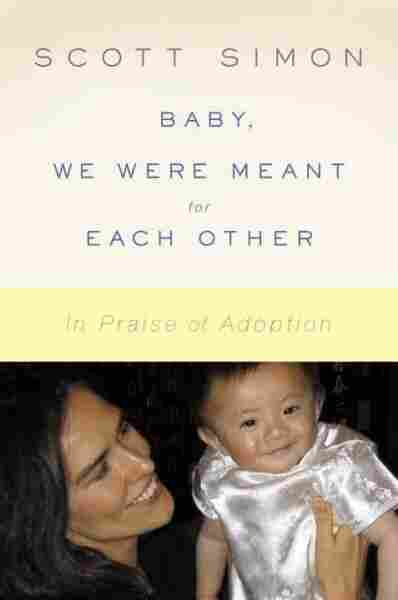 'Meant For Each Other': Scott Simon's Adoption Story In his new book, Baby, We Were Meant for Each Other, Scott Simon shares the emotional journey that ended with him and his wife, Caroline, adopting two little girls from China. 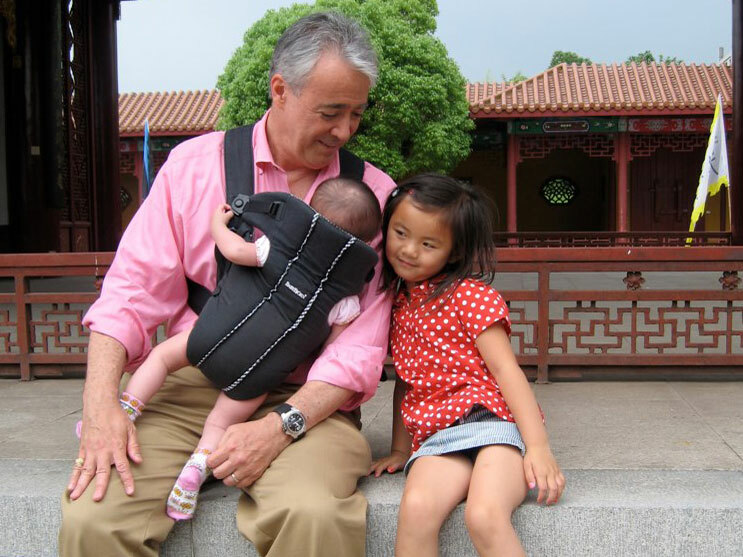 Scott Simon and his daughters Elise (right) and Lina (left) tour a temple in Nancheng, China, not long after Lina's adoption. Scott Simon, host of NPR's Weekend Edition, remembers the moment he and his wife decided to adopt. "We'd both been in places where there are a lot of children who'd been abandoned," he tells NPR's Steve Inskeep. "We just looked at each other and said, 'Why are we doing this? There are children in the world now who need our love, and we sure need them.'" In his new book, Baby, We Were Meant for Each Other, Simon shares the journey -- from struggling to conceive, to deciding to adopt, to traveling halfway around the world -- that ended with him and his wife, Caroline, adopting two little girls from China. Simon says the decision to adopt changed his life -- but it wasn't easy. He explains that the adoption process in the United States is particularly taxing and can discourage many potential parents. "It is difficult, time-consuming and expensive to adopt a child in this country," he says. "For a lot of people, the assisted-fertility industry is just an obvious alternative to that." Then there's the emotional toll that not everyone is prepared to pay. That said, Simon says he wants to help potential parents to see the natural beauty in adoption. "I would like to open that door for people," he says. "The instinct to adopt -- to take children into our lives -- is, I think, practically as old as childbirth." For Simon and Caroline, that instinct was so strong that it drowned out any concern they may have had about there being an ethnic barrier between them and their adopted children. "That baby is so much more to you than its ethnicity," he says. "First of all, they're hungry, they're thirsty, they're crying, they need sleep -- all of these kinds of things that have nothing to do, certainly, with ethnicity." And while Simon and Caroline are determined to expose their daughters to Chinese culture through history and travel, he says their ethnicity is still only a feature of their personality, not a defining trait. But not everyone sees it that way. Simon says he was shocked when a friend asked Caroline if she felt guilty for taking her daughters away from their native culture: "My wife just answered, 'No, not really.' I think I would have had a tougher time holding my tongue." Simon says it's best not to invest too much of one's identity in ethnicity. In his book, he writes about the experience of Martin Simon, the adopted son of the late Illinois Sen. Paul Simon (no relation to Scott Simon). Because Martin's birth certificate stated that he was Native American, that ethnicity became a large part of his identity. So much so, that his high school friends described him as part Cherokee and his father even became a member of the Senate Committee on Indian Affairs. It wasn't until later in life that Martin finally met his biological mother and discovered he wasn't Native American at all. It turned out that Martin's mother was a woman of Scandinavian origin who, stumped by the "ethnic" section of the adoption form, had simply identified herself as "All American." 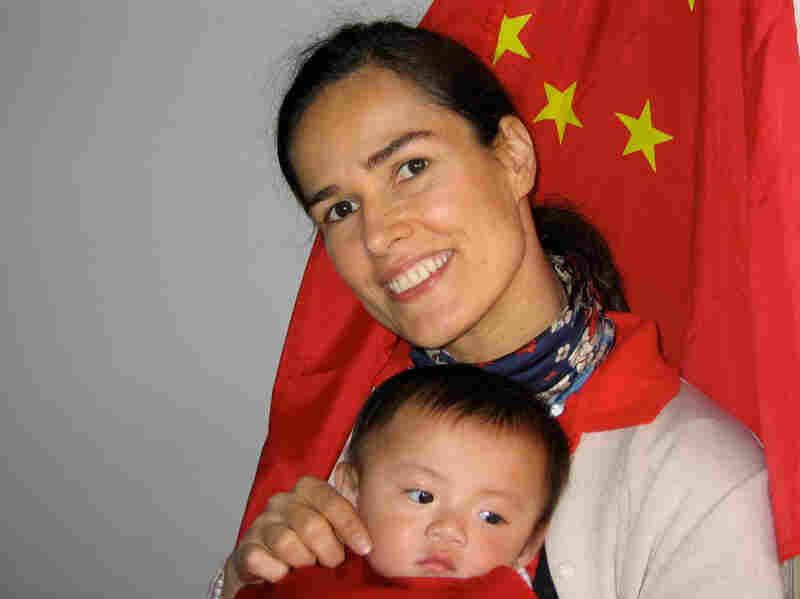 Caroline Richard Simon holds an 11-month-old Elise Simon on the day her adoption was approved by Chinese officials in Nancheng. For Simon, the vignette is proof of the power of suggestion -- but that's a subtlety his daughters aren't yet aware of. At 7 years old, Simon's daughter Elise is at an age where she's starting to ask some pretty difficult questions -- like why her biological mother gave her up -- and the answers aren't always easy for her to understand. "We tell her, 'Your mother loved you and she wanted to take care of you for the rest of your life and she wanted to be a mother to you but she just couldn't,' " Simon says. "Yet it's hard for a 7-year-old to understand. How do you explain China's one-child policy?" What's important, he says, is that his children are comfortable with being adopted and that they know the truth about it -- sad though it may be. "There is no way that we're going to spare them the sting and the hurt of feeling that at some point there was someone who gave them up," he says. "We learn from hurts in life, don't we? We put something over them and we keep on going. And I think our two daughters are going to be very strong, in part, because of that." Adoption is a miracle. I don't mean just that it's amazing, terrific, and a wonderful thing to do. I mean that it is, as the dictionary says, "a surprising and welcome event that is not explicable by natural or scientific laws and is therefore considered to be the work of divine agency." My wife and I, not having had children in the traditional, Abraham-and-Sarah-begat manner, have learned to make jokes about the way we've had our family. ("Pregnant! Why would you do that? Those clothes! And you can't drink for months!") Jokes are sometimes the only sensible answer to some of the astoundingly impertinent questions people can ask, right in your children's faces. "How much did they cost? Are they healthy? You know, you hear stories. So why did you go overseas? Not enough kids here?" But we cannot imagine anything more remarkable and marvelous than having a stranger put into your arms who becomes, in minutes, your flesh, your blood: your life. There are times when the adoption process is exhausting and painful and makes you want to scream. But, I am told, so does childbirth. We also know that the hardest parts are still ahead. Raindrops rattled the roof of our small bus, seeped through the windows, and pitted the windshield with great wet gobs. "A sad day," sighed Julie from Utah, while the cityscape of Nanchang, China, slabs of brown and gray with wet laundry flapping, rolled by our windows. Five sets of strangers were together on the bus, about to share one of the most intimate moments of our lives. We had Cheerios, wipes, and diapers in our hands. "A happy day," Julie added, "but also sad," and then we just listened to the ping of raindrops. A month before, this moment couldn't have happened fast enough. Now it was here; and we weren't ready. We had endured three days of what we had come to call "adopto-tourism" together ("You will now visit the Pearl Museum and Gift Shop! Then the Great Wall and Gift Shop! Tomorrow, the Silk Museum—and Gift Shop! "), during which we talked about the sundry things strangers do to be companionable. "And what do you do? What kind of crib did you get? Aren't they impossible? Do you know that little Indian place just off Thirty-second?" Over careful conversation between stops, we began to make some fair assumptions about the meandering paths of hope, frustration, and paperwork that all of us had navigated to get here. Most of us had probably tried to start families in the traditional manner. For one reason or another, the traditional result was not achieved. There are all kinds of wizardly things that can be done in laboratories these days; most of us had tried one or two. But wizardry does not always deliver. At some point, after all the intimate injections and intrusions, and the hopes that rise and deflate, many spouses look at each other across a field of figures scratched on the back of an envelope and ask, "Why are we doing this? There are already children in this world who need us right now. We sure need them." A few weeks before, we had received a few photos in an envelope: a small girl with rosebud lips, quizzical eyebrows, and astonished eyes. She was about six months old at the time of the picture. A dossier prepared by Chinese adoption officials told us that she was smart, active, funny, hungry, energetic, and impatient (all of which remain a good description to this day). The officials had given her a name: Feng Jia-Mei. A little girl named Excellent-Beautiful. From the Feng township. We made copies of the photos, slipped them into our wallets, sent them around to friends and families, and doled them out like business cards, often to total strangers. "Jia-Mei Simon" was imprinted along the bottom, like the name under a photo in a class yearbook. Feng Jia-Mei, Jia-Mei. Excellent, Beautiful, Jia-Mei Simon. Friends looked at her photo and wept. Something in her face, and in her tiny, tender shoulders, seemed to call out. We told people that the look of surprise in her eyes was because she had just read our dossier and said, "I thought you said that I was going to first-rate people!" Our small bus pulled up before a great gray file cabinet of a building in central Nanchang. So: this is where we are going to become parents. You walk into the building as a couple, and leave a few minutes later as a family. You walk in recollecting long romantic dinners, nights at the theater, and carefree vacations. You leave worrying about where to get diapers, milk, and Cheerios. Grinning bureaucrats received us and showed us to a staircase. They took us down a flight and into a room. We saw smiling middle-aged women in white smocks holding babies, cooing, singing, and hefting them in their arms. We shucked raindrops from our shoes and coats. We checked cameras and cell phones. We looked at the women in the smocks and then realized -- they held our children in their arms. We saw Elise. She was five months older than in the picture we had, but still recognizably the little girl in the thumbnail portrait. Pouty little mouth, tiny, endearing little downy baby duck's head, fuzzy patch of hair, and amazed eyebrows, crying, steaming, red-faced, and bundled into a small, puffy pink coat. We blinked back tears and cleared our throats. "Feng Jia-Mei?" we asked softly. The woman in the white smock looked down at a tag -- as if checking the size -- and smiled. She put her into my wife's arms. I tried to point a video camera, snap pictures, roll audio, and hug them, all at the same time. Our little girl's tears fell like soft, fat, furious little jewels down her face. As Caroline lifted her slightly from her lap to hold her, Elise soaked her own tufted little legs with a hot surge of pee. And then, as we laughed, cried, and hugged her even more fiercely, Feng Jia-Mei opened her small robin's mouth and burped up a geyser of phlegm, fear, and breakfast. Baby, baby, our baby. Back in our hotel room, Caroline zipped, snipped, and unbuttoned four layers of Chinese clothing. Our daughter looked up into Caroline's unfamiliar face without warmth or disdain; one more stranger was handling her. First the puffy quilted pink coat came off. Then a black quilted coat. A mustard-colored crocheted sweater. A little red and white shirt. A tiny white T-shirt. Four pairs of pants, white, black, gray, and pink, each with a cunning little slit in the backside (among the greatest Chinese inventions since the compass and printing). And finally, pink socks that had been tucked beneath red socks: as tiny and dear as a kitten's paws. Each layer smelled of coal smoke and pee. We laid those small clothes aside to keep for the ages. Shigu, our trip coordinator, came by our room. We told him that our daughter seemed inconsolable. Well, he had seen that several hundred times before. "You should go downstairs," Shigu advised. "Get something to eat." Our baby was famished. She inhaled a soft egg custard and plain white rice and stopped crying for a few moments, sobbing being hard to do while you are swallowing (though she tried, she tried). She sat in Caroline's lap, then mine. Her eyes were dull, defiant, and blistering. Her small cheeks burned so, I wondered if her tears would sizzle. We looked at the other happy new families across the room. They smiled back wanly. They were having as much fun as we were. I don't remember what we ate. Not much of whatever it was. I had a glass of wine, my wife had a beer, and we toasted our daughter. The drinks flashed through us like tap water. We ate and talked and tried to amuse, divert, and win over our daughter with songs, food, and funny voices, leaving her sullen and unmoved, all the while asking ourselves, "What have we done? What were we thinking? We've ripped a baby away from the only place she's ever known, to bring her some place on the other side of the world that might as well be the moon. What kind of people are we?" Excerpted from Baby, We Were Meant for Each Other by Scott Simon Copyright 2010 by Scott Simon. Excerpted by permission of Random House, a division of Random House Inc. All rights reserved.